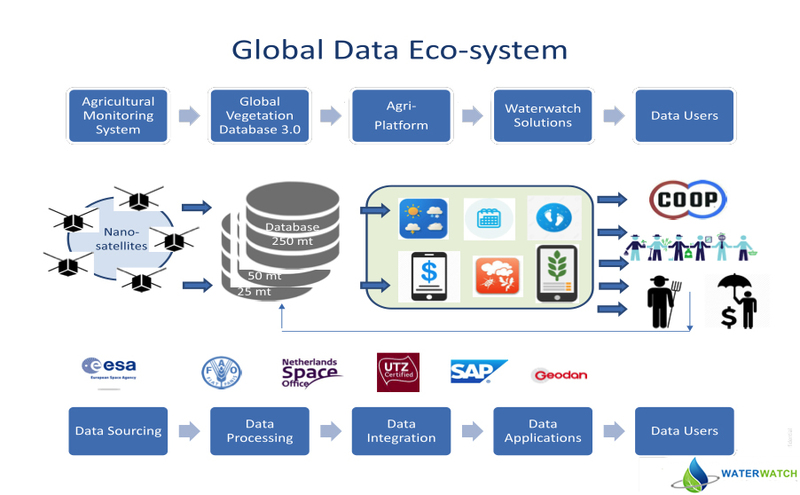 With several strategic partners Waterwatch Cooperative is developing a Global Data Eco-system which consists of several elements. The basis of the eco-system is the development of an open, uniform and global vegetation database. Waterwatch Cooperative is developing a constellation of 5 to 6 Nano-satellites, which will enable near-real-time monitoring of crops against reduced costs. Satellite-data as well as data from other sources and from farmers will be used for several applications on weather data, crop disease alerts, crop monitoring, crop calendars, crop insurance, certification, etc.